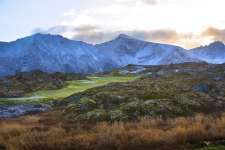 About the last place one would expect to find a world-class modern links, the Lofoten Archipelago in northern Norway was home to just nine holes of golf, when an ambitious development team decided to create a full 18 on an ancient Viking island. 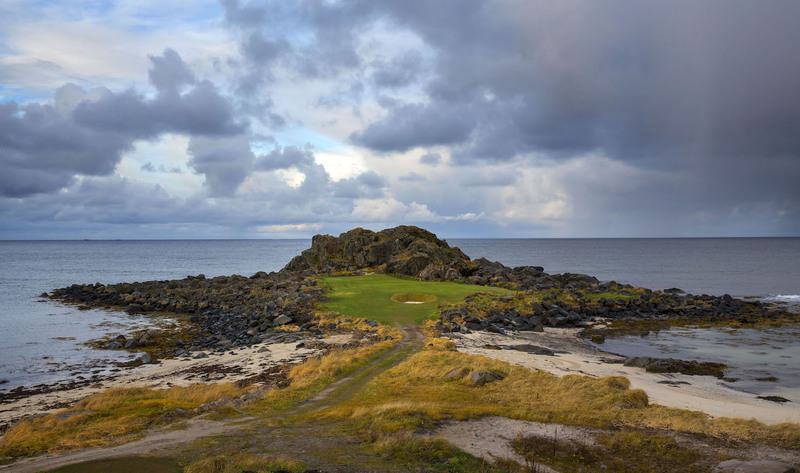 Pressed directly against a rocky shoreline and along the cold waters of the Norwegian Sea, the Lofoten Links started as a six-hole project in the early 1990s and gradually expanded to nine holes by 2008. The full 18 was not completed until 2015, following an injection of capital from private investors as well as a government development body eager to attract affluent visitors to the region. While the golf alone at Lofoten should be enough of a lure, add the endless mountain ranges, deep glacial fjords and ever-changing coastlines of these almost impossibly beautiful islands, and you have about the most naturally appealing destination for summer golf anywhere in the world. Beyond the picture-postcard fishing villages and literally endless panoramas, what makes this part of Norway so remarkable is the two full months of 24-hour daylight it enjoys in the summertime and access to the breathtaking Aurora Borealis lightshow in the winter and fall, said to glow brighter here than elsewhere within the Arctic Circle. 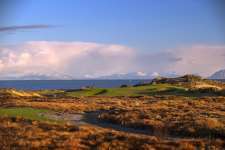 For golf, the site chosen for the Lofoten Links was a true sensory wonderland, with absolute ocean frontage and flawless 360-degree views of the surrounding mountains and out over the Sea to the neighboring islands from virtually every corner. The man responsible for extracting quality golf out of this spectacular piece of property was architect Jeremy Turner, who worked closely with the landowner and his Irish shaper to fashion a series of exciting, playable holes out of what was largely inhospitable terrain. The elevated areas away from the sea were particularly challenging, but Turner and his team did well to shape this steeper, rockier ground to appear as naturally occurring as the softer coastal areas. The use of pot bunkers and subtle bumps and ripples helped give the course its linksy feel, as did the propensity to set many of the greens down on the ground and allow them to meld with their surrounds. Although virtually impossible to review Lofoten without focusing on the scenery, there are a number of fine holes across the nines and well spread interactions with both the shoreline and the mountains. Several holes crash directly toward the coastline or bend around its bays, while others are set in the shadows of the abrupt Mount Hoven or aligned toward more distant peaks and ridges. The opening sequence sets the tone. From an elevated tee, the 1st is a drivable par four playing across a cove and featuring a marked Viking gravesite in the rough. The short 2nd is even more memorable, its green resting on a bed of rock within the Norwegian Sea. The back tee on the 3rd then involves a drive across two beaches, followed by an approach beyond another. It really is a remarkable start. About the only downside is the narrowness of the 3rd fairway for those playing front tees, and the fact that using this section of coast for the adjacent 3rd and 17th greens forces an awkward walk to the 4th and 18th tees. Turning inland, and fun, aggressively angled linkslike par fours at the 4th and 5th are followed by a gorgeous short hole at the 6th whose green is wedged into a crevasse and surrounded by what appear to be volcanic boulders, weather worn and strewn in heather. The darker rock through this upper section is particularly attractive and although the longer holes are a little cramped from the tee, each is forgiven for the outlooks and the fact that approach shots, for those skilled enough to find the fairways, are generally exciting. Remaining highlights include the strong par three 12th and the second half of the 13th, which drops and doglegs toward a glorious low-set green at the edge of a dramatic promontory. The views, the crumpled undulations, rugged bunkering, rock and resident Sea Eagle all combine to make this Scandinavia’s most exhilarating par five. Matching the staggering beauty of the 13th is the long par four 16th, initially blind across a heathery hillock and then played toward a classically understated green site pushed back against the Norwegian shoreline. 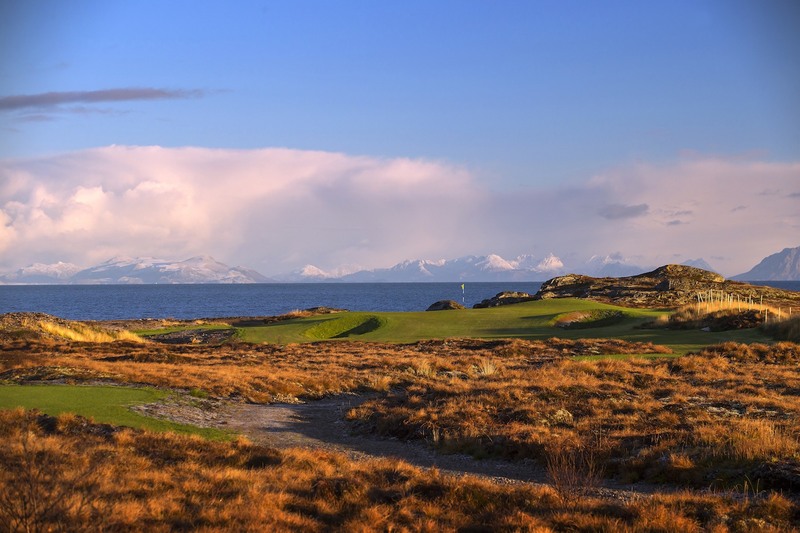 Lofoten Links may not be as well known internationally as other courses in this book, but it deserves full recognition for the thrill of discovery and the sheer adventure of taking your clubs somewhere so remote and so unspoiled. It can be hard to concentrate on the golf in such surrounds, but visit in summer and perhaps the fact that you’re teeing off near midnight will render the setting less distracting.